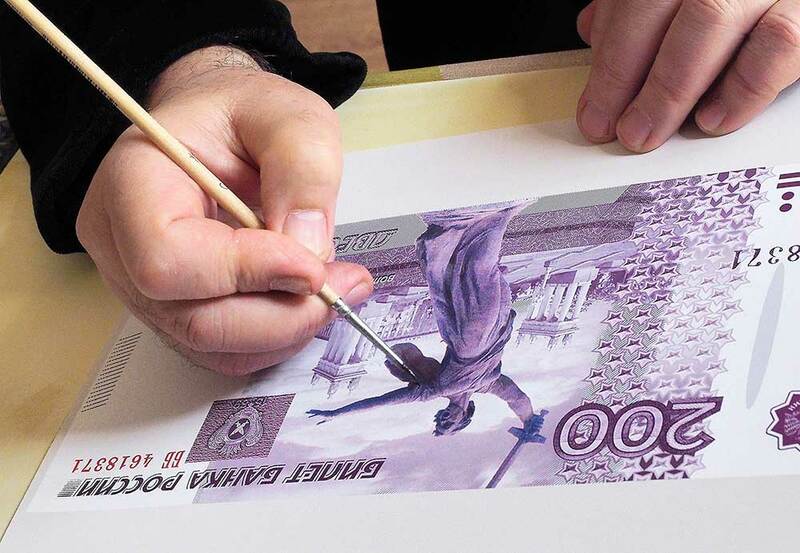 Volgograd artist Vladislav Koval designed the banknotes 200 rubles denomination, April 2016. New banknotes with denomination of 200 and 2,000 rubles will be in circulation in late 2017, Chief of Russia’s Central Bank Elvira Nabiullina told a press conference held at the TASS news agency on June 28. "Usually, it takes from 1 to 1.5 years to design a banknote, and we expect that these new banknotes will be launched by the end of 2017. As for the volume of the issue, it will be determined later on the base of the dynamics of a possible demand," she said. Nabiullina said that the Central bank is now launching the All-Russian campaign to select the images the new banknotes will carry. "By tradition these will be views of Russian cities and territories, their main symbols of them," she said. The head of the Central Bank said that images for the new banknotes will be chosen during a three stage contest. The first stage starts on June 28 and will end in July. At this stage Russian citizens are invited to propose cities and their symbols at a special website. At the second stage, in August, the Public Opinion Foundation will conduct an opinion poll to select 10 most popular cities and territories and corresponding 20 symbols. At the third stage, in September, two cities winners and respectively four symbols of those cities (two for each city) will be chosen from the list of ten. On October 7, the Rossiya 1 TV channel will broadcast a program where Russian citizens will be invited to make the final choice via an sms vote, Nabiullina said. She added that the issue of new banknotes will not affect the volume of monetary emission and won’t require additional costs. "This is not an additional emission," she said. She added that the introduction of new banknotes meets the Central Bank’s target for lowering inflation. "This is related to a decrease in the rate of inflation. The experience of other countries shows that bills with a 200 face value are usually introduced in the countries with fairly low inflation, not more than 5 percent. We believe that we will achieve their goal (on inflation - TASS) and this was one of the reasons, why we release new banknotes," she said.